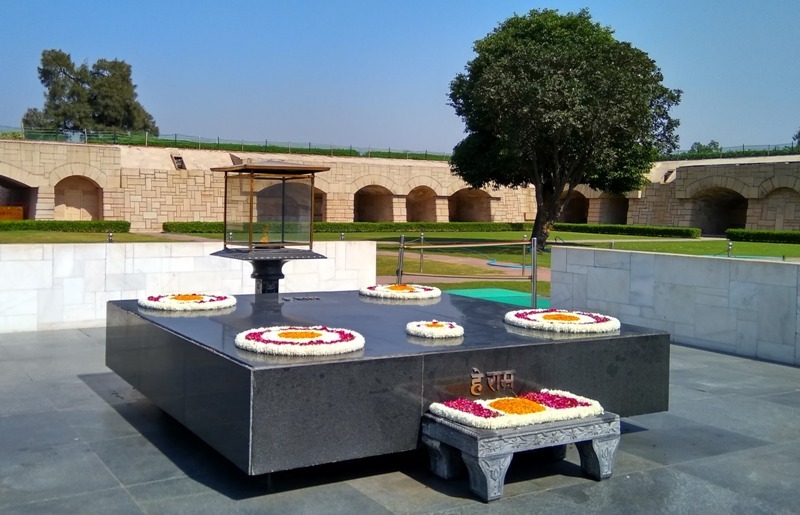 Rajghat is a memorial dedicated to Mohandas Karamchand Gandhi (Mahatma Gandhi). It is situated on the banks of the Yamuna River on Mahatma Gandhi Road. It’s a black marble platform where last rites of Mahatma Gandhi were performed after their assassination on 31th January 1948. It is an open air memorial of Mahatma Gandhi and this place is spread in large green area. This area is surrounded by beautiful trees, plants, flowers, etc. a lake and jogging track is also located in the Raj Ghat. Timings of Raj Ghat are from 6.30 AM to 6 PM. Rajghat opening time is 6.30 in the morning and closing time is 6 in the night. It remains open on all days of the week. No weekly off for Rajghat. Entry is completely free for Indian and foreigners. People of all races and religions can visit this beautiful and calm place without purchasing any tickets. Raj Ghat is located on the backside of the Red Fort. The Delhi Gate Metro station is the nearest metro station to reach the Rajghat. This newly built metro station is just 800 metre away from the Raj Ghat. This newly built metro station is the part of Violet Line, which runs from Kashmere Gate to Ballabhgarh. The rest of the distance from Delhi Gate Metro station can be covered on foot or a local transport can be hired to reach here. Multiple buses are ply on Ring Road where Raj Ghat is located. Raj Ghat Bus Stop is opposite to the memorial and buses from each corner of Delhi NCR are halts here. It is 5 KM away from Kashmere gate inter state bus terminal and 4 KM from New Delhi Railway station. Visitors must have to remove shoes while entering to the memorial. Drinking water and washroom facility is not available. A free parking facility is available for the visitors. A security check is required to enter in the Raj Ghat. Photography is allowed. Visitors can also visit museums dedicated to the life cycle of Bapu situated in the complex. Minimum 1 hour visit is required to cover the place. If you are planning to visit this place in summers, morning and evening time is ideal time due to the hot weather of Delhi. Rainy and winter season is the best time to visit this place throughout the day. While visiting this place visitors are advised to cooperate with security and maintain the decorum of the place. Many other memorials of known person are located in the same gardens like Shantivan, Vijay Ghat, Shakti Sthal, Samta Sthal, Kisan Ghat, Veer Bhumi, Ekta Sthal, Karma Bhumi, Sangharsh Sthal, P.V. Ghat, Jannayak Sthal and Smiriti Sthal. Visitors should visit these places also. Address: Mahatma Gandhi Marg, Ring Road, Behind Red Fort, Delhi – 110006. Also visit Red Fort, India Gate, Lotus Temple, Zoo, Old Fort and check places to visit in Delhi.